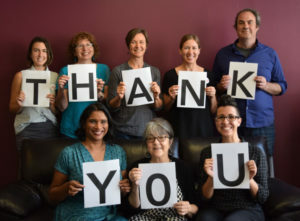 Thank you to Bunker and Survival Media Agency for taking the powerful photos we used in our year-end fundraising materials. Thank you to Xiomara Blanco for volunteering her skills as a photographer and joining us at the Rise for Climate, Jobs, and Justice march to make sure we had beautiful and powerful photos of the day. Our Emcee Shakirah Simley for guiding us through the event with warmth and a healthy dose of truth-telling. Ghirardelli Chocolates & Miyoko’s Kitchen for providing hors d’oeuvres and chocolates. Thank you to Mahkana for our newest special promotion. Mahkana sells beaded bracelets with a set of color combinations that are exclusive to each nonprofit. The best part is 25% of net proceeds for each bracelet gets donated back to Breast Cancer Action! Click here to get yours today! Thank you, always, to Lori Gibson and Pure Haven for their October promotion to benefit Breast Cancer Action.